Matchplay Masters 2014 – Felix v Bas – the Aurora Curse continues! Awesome weather for the MM final, Basil was wearing his lucky shirt but saving his new shoes for the Bougle. I hit a 5iron up the left side, Basil hit a cracking 3 wood near the hump. I hit a horrible 2nd pulling it near 40left of the pin and on sand. Bas hit an smashing approach (GW I think) to 3ft with a certain birdie to come. I managed to get lucky out of the sand and got my ball to 3ft. Easy Birdie for Bas, Par for me – Tied hole. 9th I cannoned a 3wood 40m in to a blackwood. Bas just to be interesting also hit a hit right but he managed 150m. FYI Leroy also found the trees right and Gaz showed us all how it’s done drillnig down the fairway. I went up the 10th fairway so lost sight of Basil but I was in the greenside bunker for 3. Basil’s ball was on the green when I got there but he was there for 4. I chipped out badly to where Basils ball was and we both had tough putts down the green to the hole on the bottom tier. Basil just crept it over the rise and had a tap in putt. I did the same and double bogey for both meant we tied the hole. I 3 wooded it down the fairway finishing on the right side in the 1st cut. Basil thundered a drive to the same distance but on the fairway and enough room to attack the green. I laid up then hit duff to be short of the green for 3. Bas hit a crisp 3 wood down the hole to be short for 2. We both ended up behind the hole and 2 x 2 putts meant a tied hole. I took off the pressure immediately by slicing it backwards over point for 6. I then pulled one over mid on for 4. Basil hit his straight over the bowlers head for 6. I asked Bas how the pressure was going and asked how tired he was. My legs were starting to stiffen (5.5+ hours to this point). Bas smiled and said yup plenty of energy. 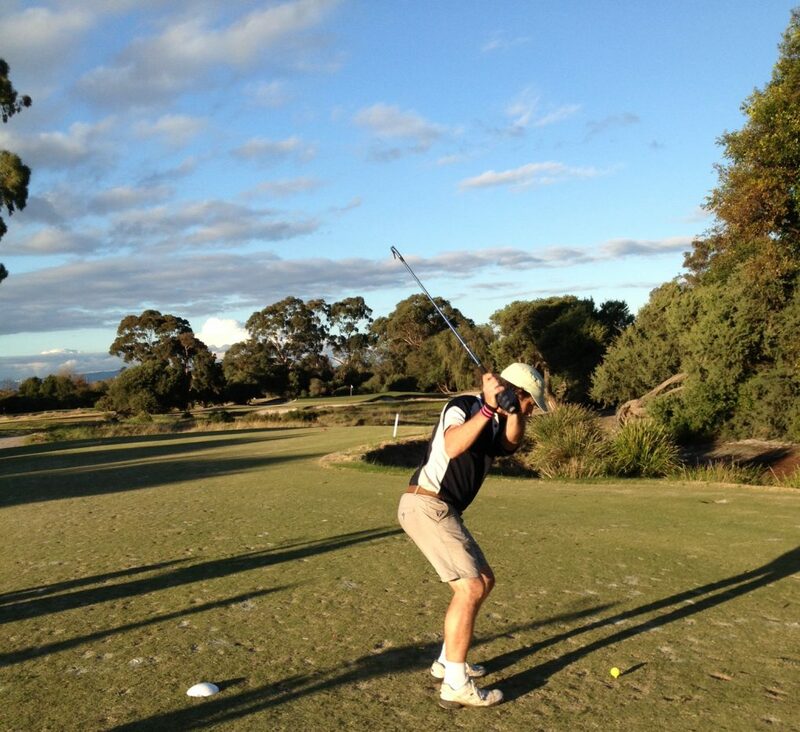 Basil got out driver and hit the worst shot in the universe backwards over his head into the marsh near Barilla bay oysters… As if, Bas pummelled his drive to the right side with only a 9iron in. Basil pulled his tee shot left and short but about 30m, I hit my tee shot pin high over the right hand bunker but in thick grass. Bas had to contend with a small tree and was above the hole for 3. I duffed my chip, and was below the hole for 3. Bas just missed his putt again leaving me 2 for the win. It was a disappointing last hole to win with a double but was heaps of fun and glad the competition was close all day. Posted on August 11, 2016 February 4, 2017 by Gentlepersons' World Golf Tour, Tasmania	This entry was posted in golf and tagged aurora, curse, golf, majors, matchplay, tasmania. Bookmark the permalink.